There are cost advantages for both users and operators of these solutions thanks to Unified Communications in the cloud. Competences and responsibilities are clearly assigned. The operator can be a traditional, external service provider or in larger structures it could be a service department within the company. The most important advantage for the user is cutting the effort needed in one’s own IT Department. That starts with administrator training and spans installing new releases and setting up or changing individual subscribers. The operator assumes all of these tasks as a competent partner. The innovaphone PBX VoIP phone system’s provisioning tool ensures that a new IP phone with default settings searches for the respective server itself after commissioning and assumes the centralised configuration from there. PBX / IP telephony and Unified Communications (UC) in the cloud are a stable and inexpensive alternative to buying a VoIP phone system, particularly for companies with a flexible number of staff, continuously changing branch offices or other dynamic structures. Not only the VoIP phone system’s central system as well as the applications for Unified Communications, but also the solutions for Video telephony, Fax, Voicemail or Conference calls are outsourced to the provider operator where they are managed and maintained. Trained personnel with sufficient experience ensures that the system is kept up-to-date on a permanent basis and that the security requirements are met. Only the pure IP network is in the company’s own building with a connection to the provider. 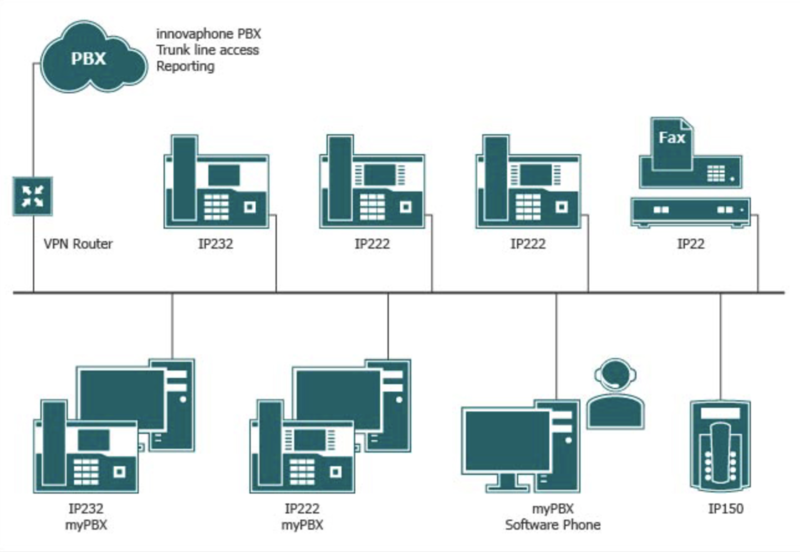 Branch structures merge to a unified system with solutions for innovaphone PBX and Unified Communications in the cloud. Each branch office no matter what size, needs only access to the provider to be immediately and fully integrated into the communication system of the company. The path to becoming a PBX hosting provider is easy for certified innovaphone Resellers. Setting up a Hosting solution is as easy as any other installation. That is how easy it is to offer customers an attractive alternative to buying. A completely new business with great potential for resellers due to the easy entry. It even enables small system houses to offer their own solutions for innovaphone PBX and Unified Communications in the cloud with relatively low initial investment. PBX hosting offers a complete IP telephone and Unified Communications solution for customers of any size and therefore ensures that this expertise is used frequently and effectively. For new customers, the system can be extended easily without any restrictions in total size. The multi-client capability of the solutions for innovaphone PBX and Unified Communications in the cloud allows separate configuration and billing for each customer. And because administration work to the end device is done remotely, on-site visits are no longer necessary. The connection to the public network takes place traditionally via ISDN or to a SIP provider. Multiple SIP trunks to other providers can be integrated via other ports. The number of channels is only limited to the bandwidth of the trunk lines. Usually, voice data is not transmitted via the provider, but from end device to end device, so that the bandwidth on the SIP trunk is mainly used for signalling. The problem of the network connections to ISDN and other networks will be outsourced on the SIP trunk to the SIP provider. The innovaphone Cloud solution can also provide the connection to other networks via media gateways. It is also possible to set up this innovaphone solution for any number of channels. The innovaphone media gateways from innovaphone are available in various sizes from one ISDN connection up to multiple PRI connections. All these VoIP gateways can also be installed several times. With multiple installation they become a logical unit so that network transitions of any size can be realized. Ideally, the VoIP gateways are distributed in different local telephone networks, to minimize calling costs. A special feature of the innovaphone VoIP gateways is that it is possible to extend the gateway to become a complete telephone system simply by installing a PBX license. Thus provider solutions can be extended easily and quickly from media gateways to hosted PBX solutions. 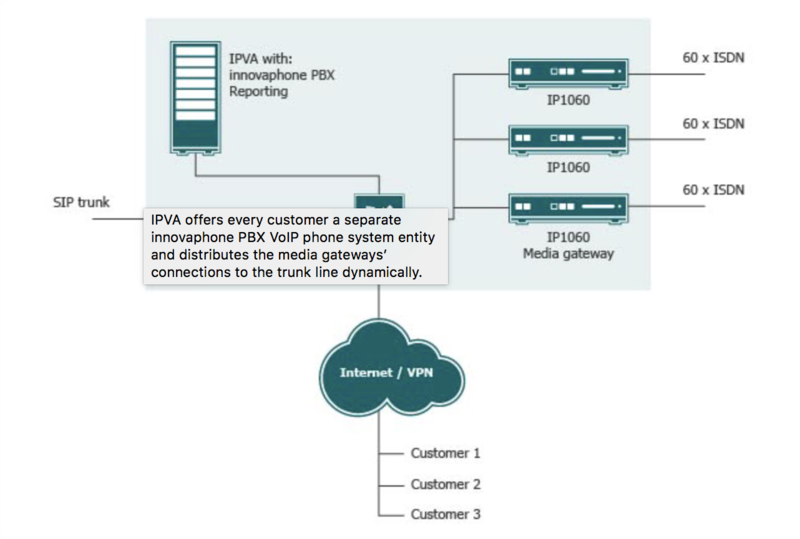 IPVA offers every customer a separate innovaphone PBX VoIP phone system entity and distributes the media gateways’ connections to the trunk line dynamically. The innovaphone Unified Communications solution can work on different devices. It is always possible to make adjustments to the size of the overall system. Thus, the innovaphone PBX VoIP phone system is installed on a media gateway, if the system is still growing. Larger installations are installed on a separate IP0010 VoIP gateway, which performs the duties of the innovaphone PBX VoIP phone system in a dedicated fashion. For even larger installations, it is possible to use innovaphone virtual appliance (IPVA). The innovaphone Virtual Appliance (IPVA) is an innovaphone PBX, which has been installed as an application in a VMware environment. Despite this virtualisation of the innovaphone PBX VoIP phone system, the complete scope of the communication solution is available. The VMware environment, however, makes it possible to set up multiple virtual servers on a single hardware platform. This allows systems with a variable number of PBX entities to be managed centrally – this is especially interesting for PBX hosting, providers or other service providers, but also for customers already working with a VMWare environment. The installation of new customer solutions is limited to setting up an innovaphone PBX VoIP phone system in a new VMware entity. Individual customer PBXs are securely separate from each other and can be managed and billed easily. Also, there is no limit to the number of registrations on the innovaphone Virtual Appliance (IPVA) as long as the VMware platform has been designed with sufficient memory. innovaphone Reporting collects all information about the activities within the innovaphone PBX VoIP phone system and provides comprehensive ways to evaluate and archive this clearly and conveniently at the push of button. Therefore, an overview of the calls in a company is created quickly and easily.